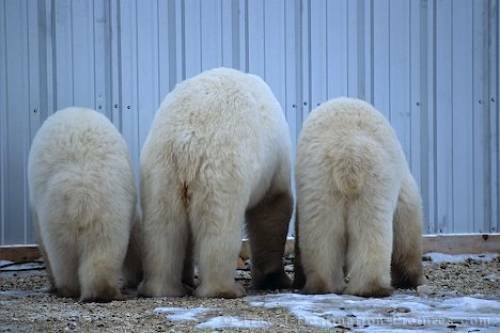 The rear ends of three cute polar bears sniffing out some morsels of food along a tin fence in Churchill, Manitoba. A great place in Canada to see Polar Bears in the wild is the Polar Bear capital of the World, Churchill in the provence of Manitoba. Picture of a family of polar bears in Churchill, Manitoba, Canada.